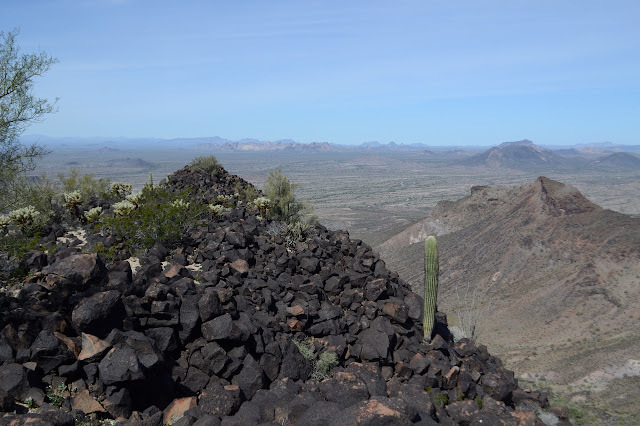 I don't want to neglect the Goldfield Mountains simply because they have not been designated wilderness. I can see approximately two named peaks in an area that should have a lot more, so it looks like they have been neglected enough. There is one showing many layers that has caught my eye. It gets the sun long before a lot of what is east of it, so it must be quite high up. I want to go up that one. Maybe it is Dome Mountain, the high point of the Goldfields. It doesn't seem to be in quite the right direction, but I'll go for that one. If it's the one, great. If not, I'll still be on a worthy peak. 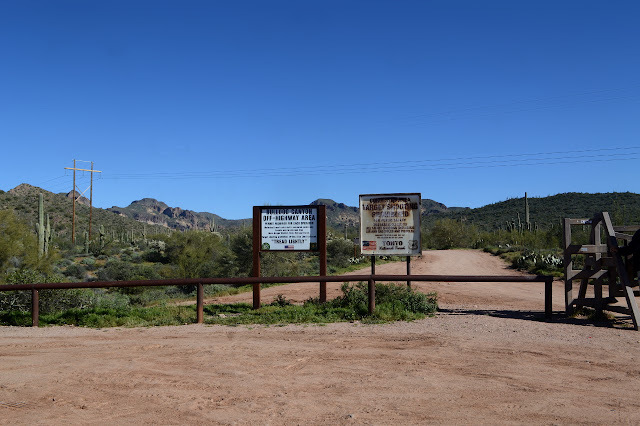 To enter the area with a vehicle, one needs to pick up a free Bulldog Canyon permit from the Mesa Ranger Station, but since this is a 4WD area, I'll just use one of the many parking spaces outside the gate and walk in. 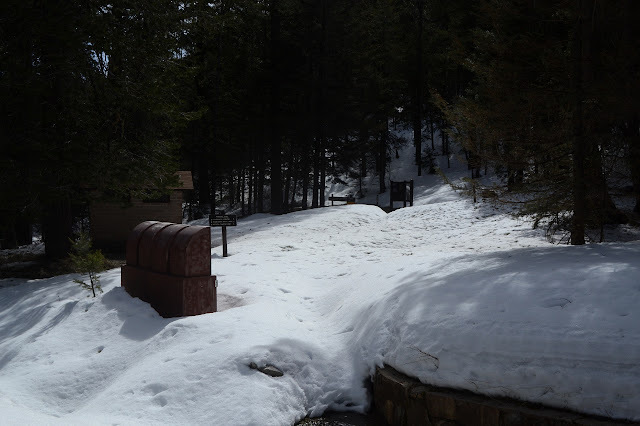 One of a few gates into the Bulldog Canyon area of the Goldfield Mountains with a fellow dueling the lock which seems to have the wrong combination today. 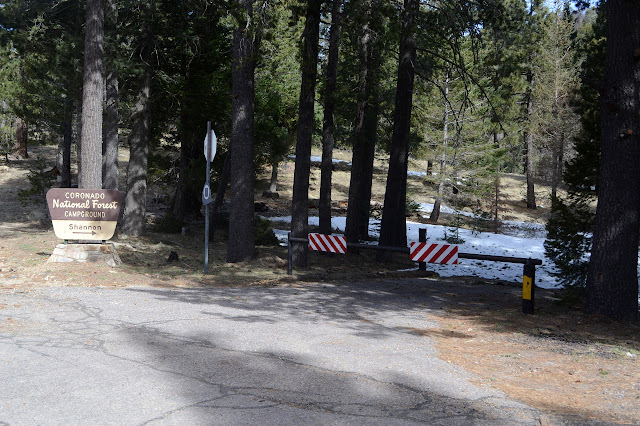 The road on the far side of the gate is actually better than the little bit up to the parking area and I am a little disappointed that I did not go ahead and get a permit. That only lasts about a quarter of a mile before it roughens up and starts gaining sandy spots. I probably could drive it, it just wouldn't be good judgment to try. Travel is supposed to be restricted to marked routes, but there are more than enough random illegal roads to get lost in for a while. The main route seems to correspond with my route. Traffic isn't bad. Besides the guy battling the combination lock when I started, there hasn't been anyone. 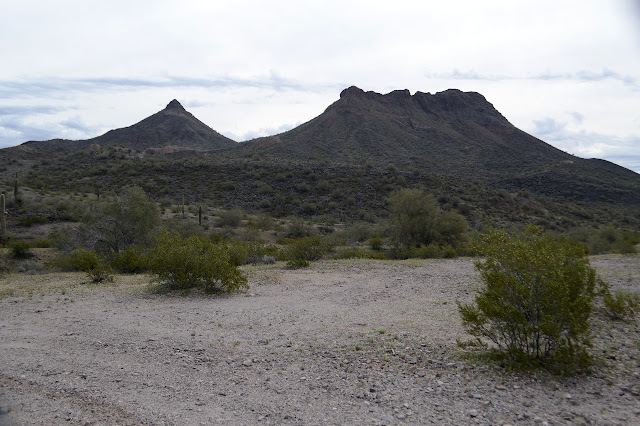 Dome Mountain, the target, is just ahead in the back. 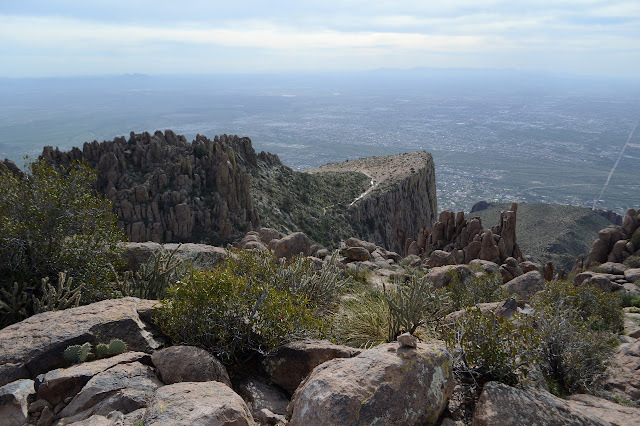 The peak at the left is a subpeak and the peaks to the right are a cluster of unnamed peaks. There is a spot that looks like a parking area by a road that appears to be marked not for any vehicles. That one is my route to get up close to the mountain. Sometimes I hear someone driving around to the south, but there is still no traffic around me as I drift up the road. Smooth mountains with a little texture transition into buttes off to the west. 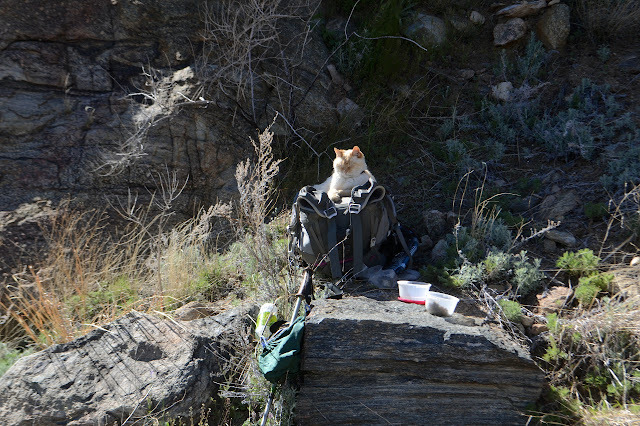 I had thought I might try this loop backpacking with the cat, staying near the spring, but it is just so short (as a shakedown trip should be) and that would preclude the possibility of finding a way up Hackberry Mesa and it really is just easier to day hike, so the excuses mounted and Timmy had to stay behind again. The weather man says there will only be a 4 hour break from solid clouds starting at 7AM, so I got moving early enough to enjoy some golden hour light. Since the trail is so short, I decided to just walk the mile rather than drive the 4 miles to get to the start. 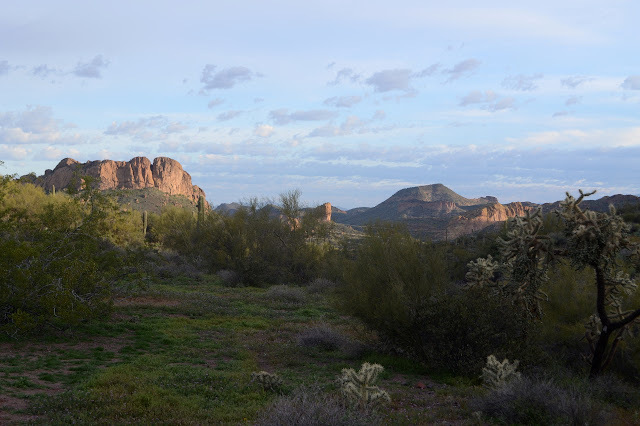 Across the way are the Goldfield Mountains bathing in the golden morning light. 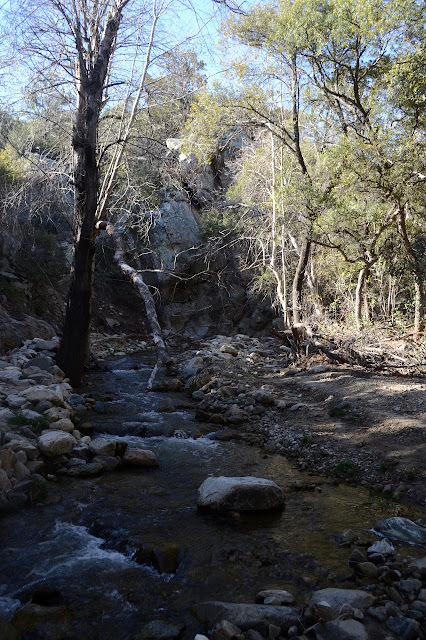 Hackberry Spring trail starts at the horse parking for First Water. 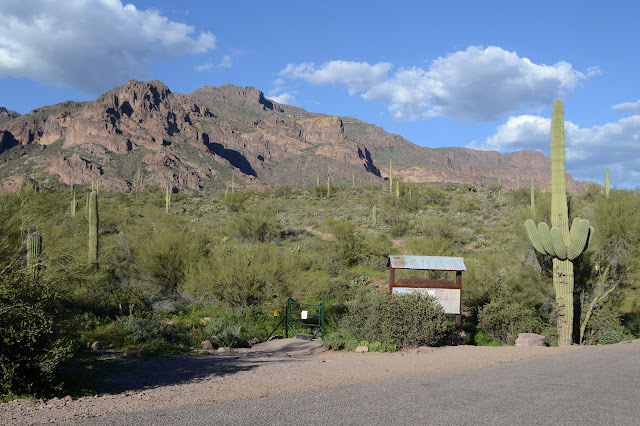 There are bathrooms, no camping, and the Tonto Pass is not required for the abundant parking. There are a few cars already including one with backpackers getting their gear together. 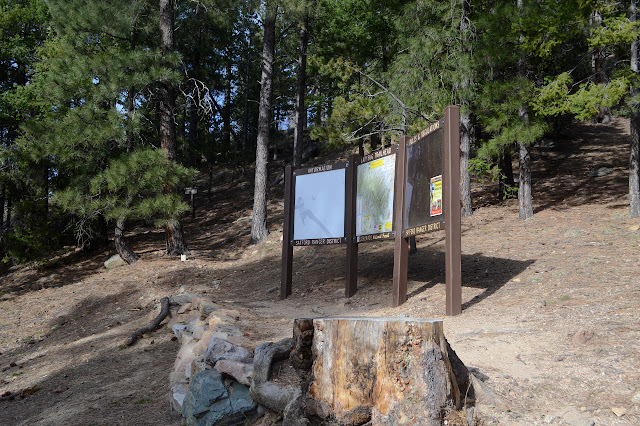 The trail is signed at the northwest end of the lot but wide use trails quickly try to confuse one about which way to go. It gets worse. A sign post a little further along shows the direction of the official trail where a major use trail breaks off and someone has attempted to "correct" the sign. That has been fixed, but now someone has added, "horse trail, steep" to the sign instead. Horse trails are rarely the steeper option. The trail to the right looks more used, but it quickly dwindles whereas the one to the left seems to grow, so after starting right, I ultimately choose left, sticking with the official, not at all steep trail. It does go up and down some hills instead of down along a gully allowing me to have some views. 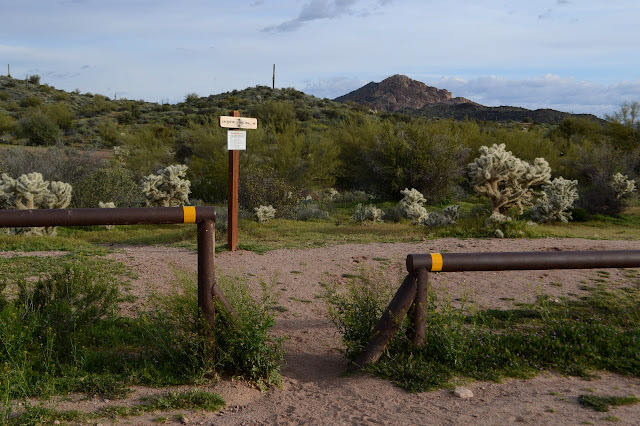 A break in the barriers and a simple sign show where to start Hackberry Mesa Trail. It also comes with a warning about a rabid skunk seen in the area. 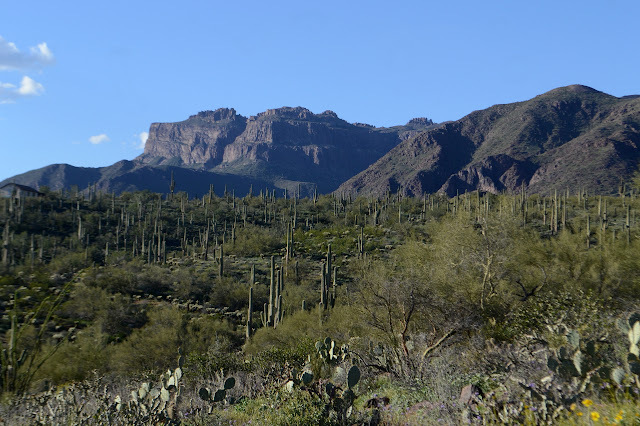 Superstition Mountains in the morning light. 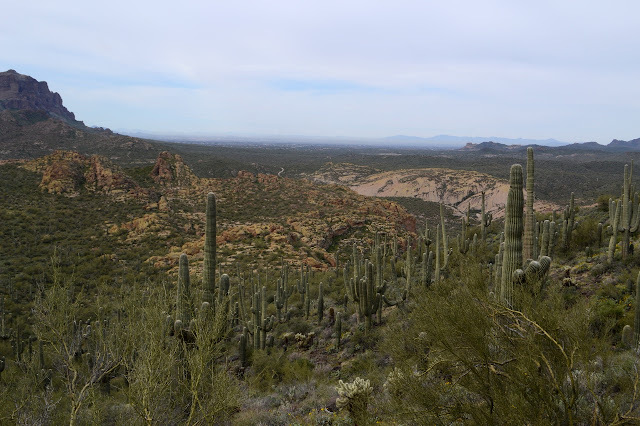 There are plenty of cholla, but not on the trail. I enjoy the official trail very much and am glad I took it. I do wonder how these short hills with trail that is just a bit more steep than gentle get to be called "steep" by someone. Maybe they only hike flat lands. The gully undoubtedly does not undulate at all, so comparatively it is so. 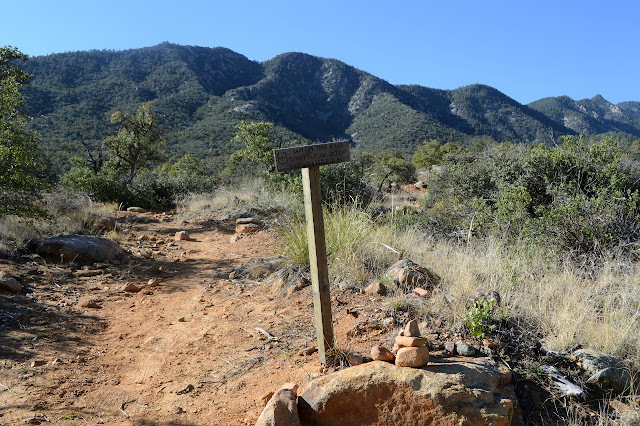 There are plenty more signs pointing out the trail when use trails are strong. 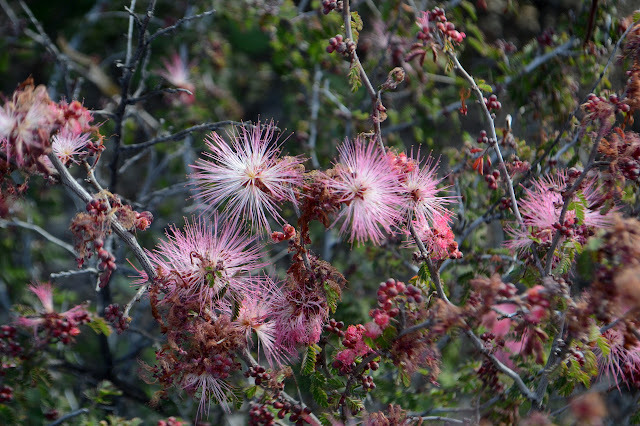 The bright pink puffs are popular in local gardens, too. 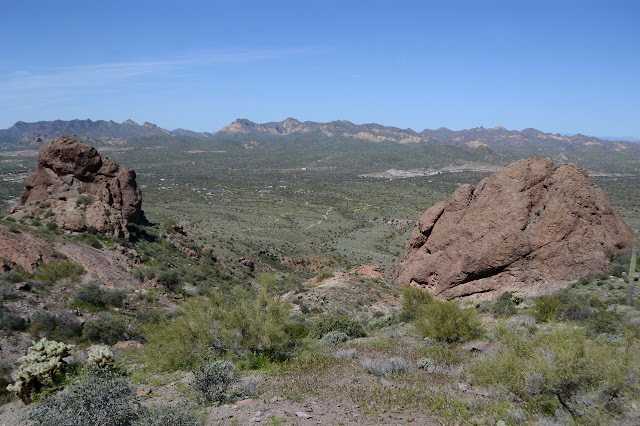 The Hieroglyphics Trail caught my eye while looking over the map for my previous visit to the Superstition Wilderness. Nothing happened with it then, but it will now. 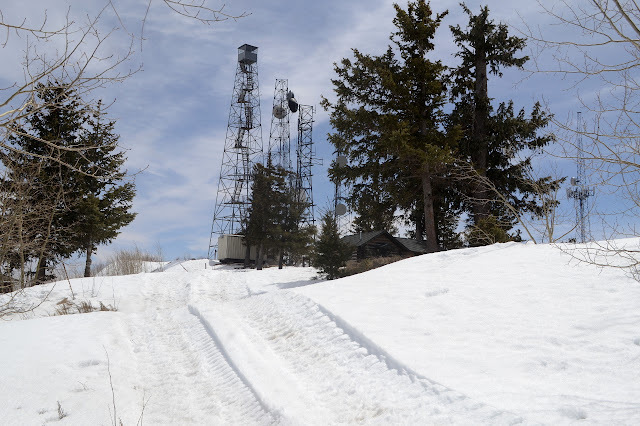 There is actually a way up to the high point of the same ridge I was on a few days ago along unmaintained use trails, but I am only looking for an evening hike to the spring today. Parking is available 5AM to 10PM after which cars might get towed, so I guess no overnight trips can start from here. 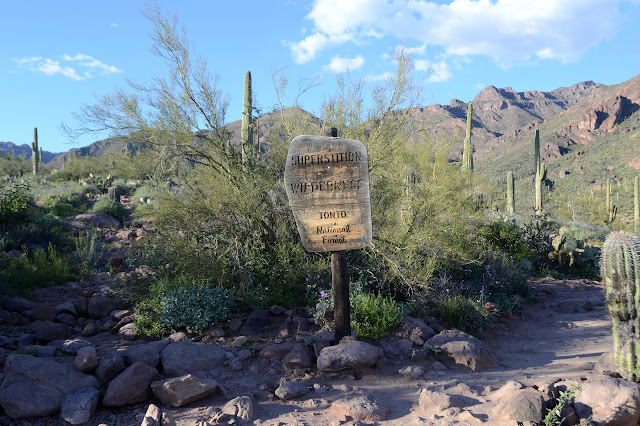 Signs at the trailhead talk about the history of the trail and how the community has managed to get it where there was once access only by trespassing, but nothing about preservation of the petroglyphs (they are not known to actually be hieroglyphics) from careless visitation even though they are the destination of the official trail. 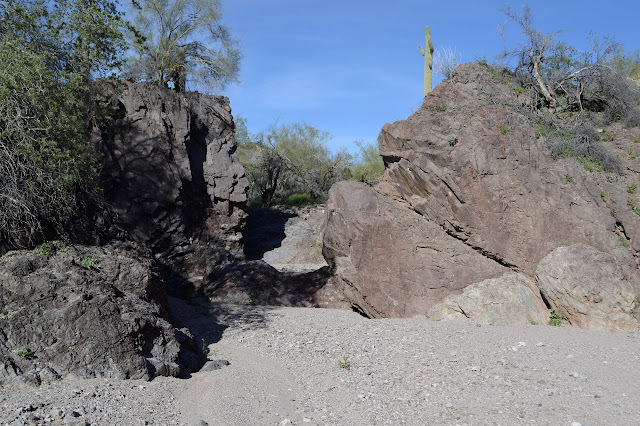 Both the Hieroglyphics Trail and the western section of Jacob's Crosscut start here. Information is directed at the second. So through the cattle gate and up the hill I go to the well signed junction. I feel a little bit of familiarity about the hills to the east although I was looking at them from quite a different angle before. 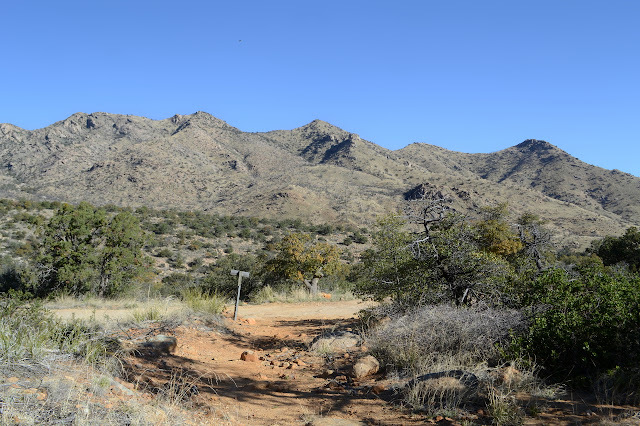 The trail climbs a little higher after taking the left and there is another cattle gate at the wilderness boundary. At least there should be no cattle spending the day rubbing at the petroglyphs. To the west past Hog Canyon is The Flatiron once again. Hieroglyphic Canyon up ahead looks like it might already be losing the light. 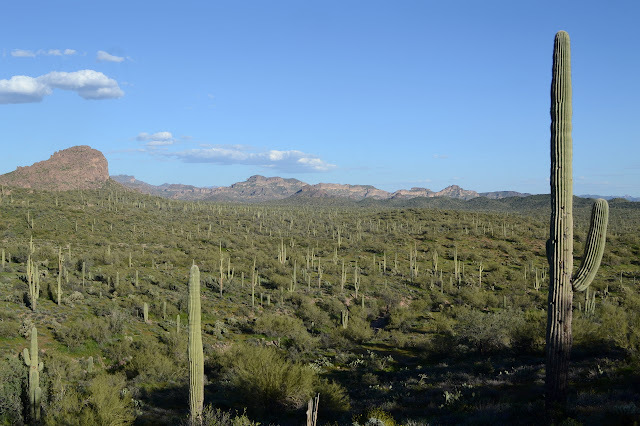 The hills east across the saguaro cactus forest could be just a little bit familiar. 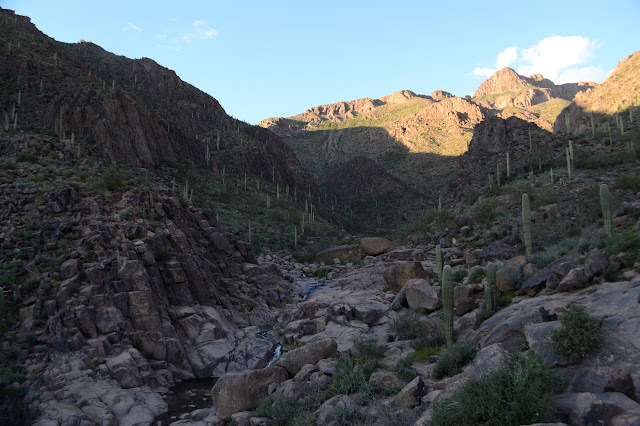 Entering the Superstition Wilderness. This is a very well traveled trail. 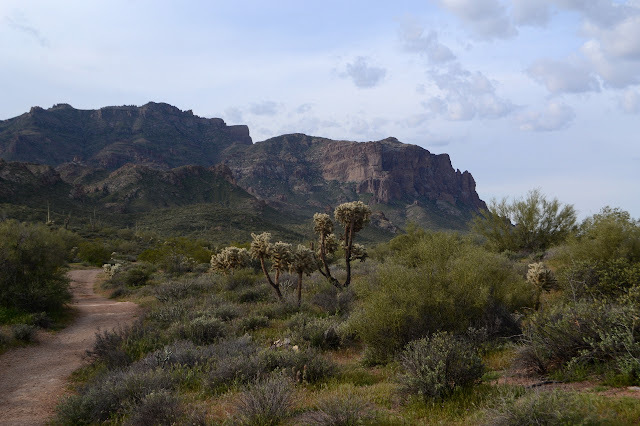 Ah, the Superstition Mountains. They really are a jewel of the state and right now they seem quite green. Of course, I'm out to get up into them and around here, they actually have trails. 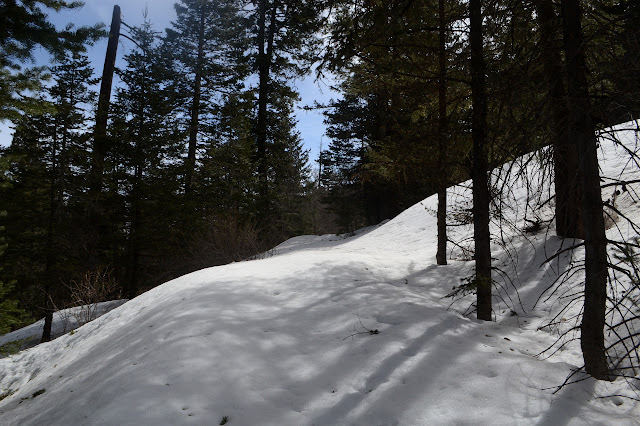 The one I am after is a non-system, unmaintained trail, but it will still be a nice change to be on even that much trail. 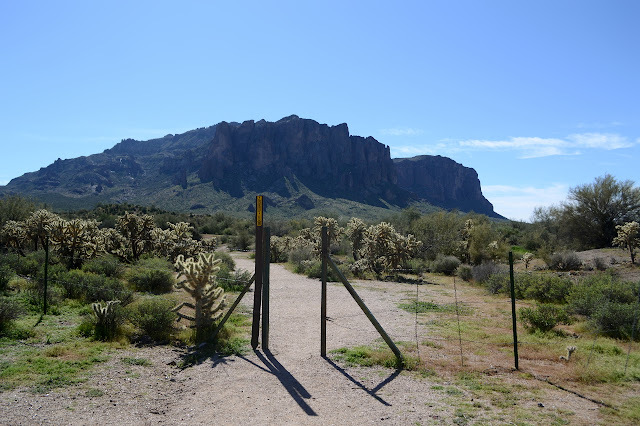 Entries exist north and south of the Lost Dutchman State Park as well as within, but it seems silly to pay $7 to go in and then walk right back out again. I'm starting at the north end at the first lot on the road to First Water although the closest is at the south end. It's only 6 miles up and down, according to the information for the geocache at the top, so this gives me a little more area to explore. On trail! 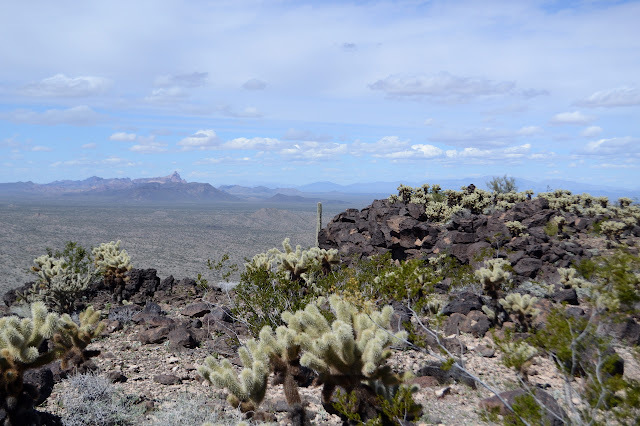 Cholla can still be a problem when on trail, but not all that often. Oh, the delight of being on trail. 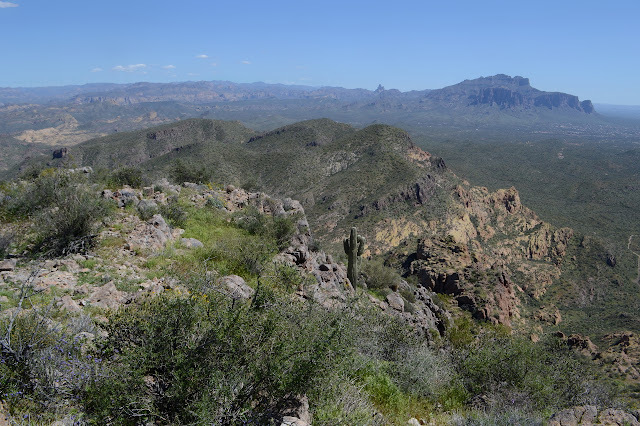 Southward to the Superstition Mountains. Siphon Draw goes right up the middle between the rock faces. 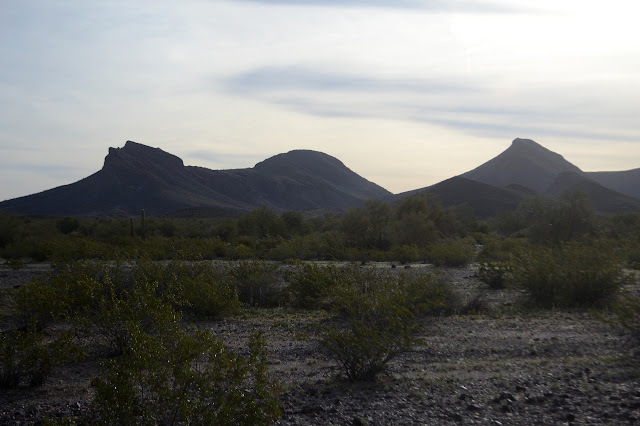 Four Peaks rising up behind a nearby butte. This area does get enough foot traffic that the trails grow side trails and secondary trails and the like, but the way to go seems pretty clear. Even this trail from the parking lot is an extra spurring off Jacob's Crosscut. 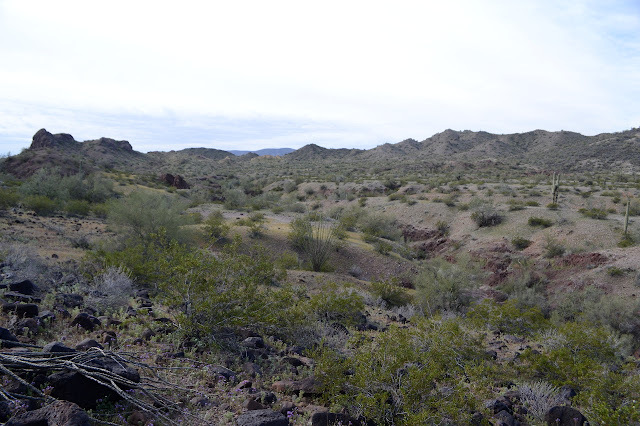 Arriving at the crosscut, there is only a sign pointing out where it goes and none for the trail I have just come along. 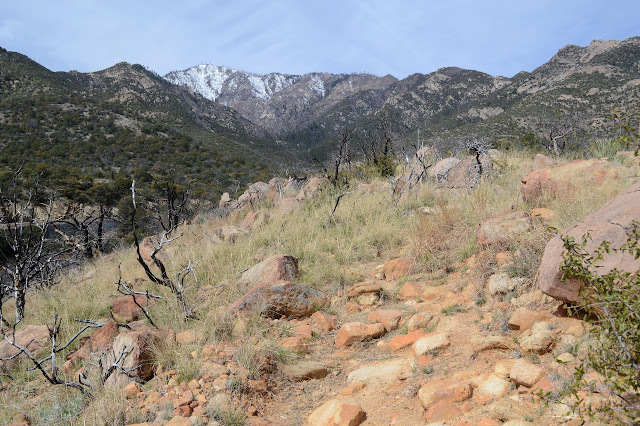 Not much further is a similarly partially signed trail climbing up into the mountains. Shortly after that is a bit of the Treasure Loop. 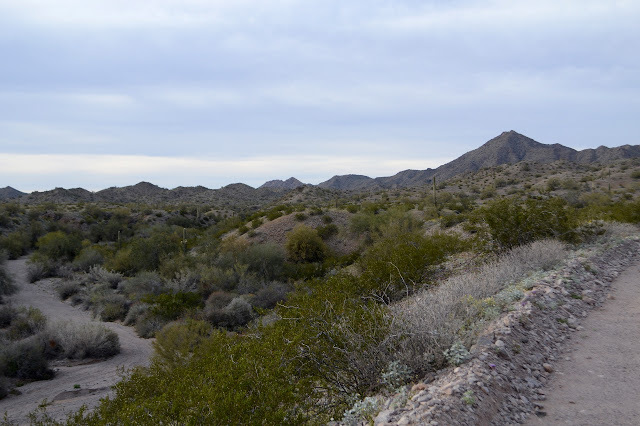 It all looks flat to me and the reported trail length to the top isn't so much, so I figure I'll have a little bit of route that is not the same trail coming and going. 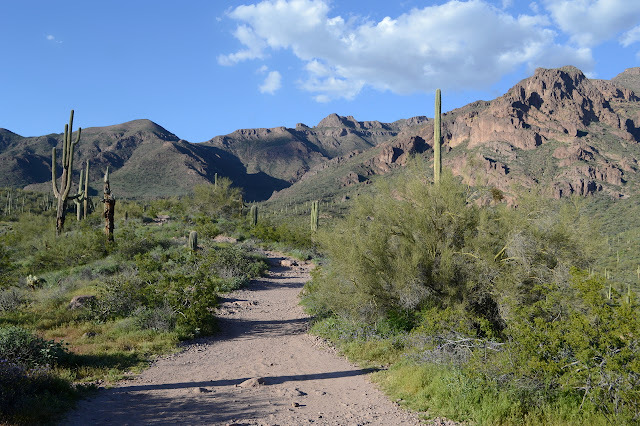 The trail is as wide as a road and, in a word, crowded. 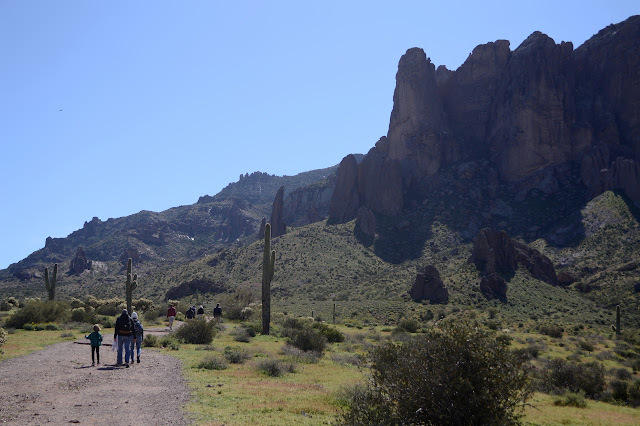 Lots of folks hiking out of Lost Dutchman State Park on the Treasure Loop. The trail actually does get to some little bit of climbing. I skip a spur that continues on just a little bit more before starting down the more southerly of the other two roads. Looking down from near the top. 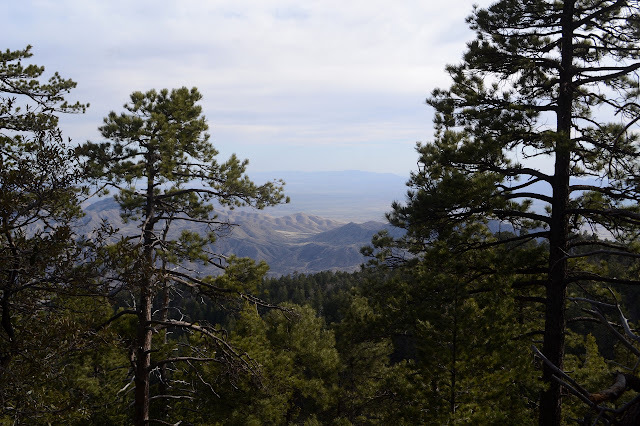 Down there is the State Park, a "ghost town", and the Goldfields beyond. 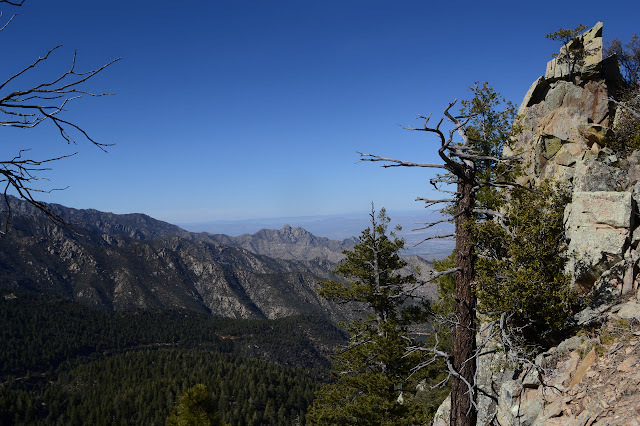 Cortez Peak stands out for its plainness to my eye, but I remind myself that when I'm on it, I'll be looking at all the other peaks. 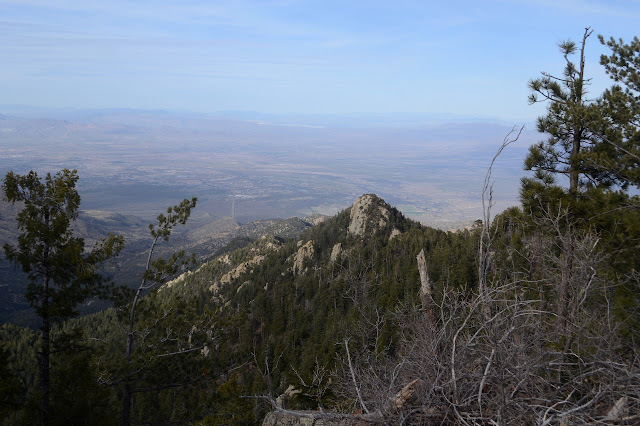 It's one of the higher ones of the area, besides Woolsey which is so much higher than the rest. 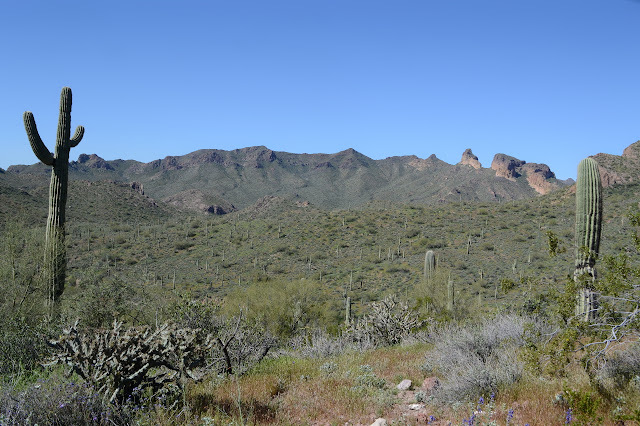 It looks like it might have less cholla on it. 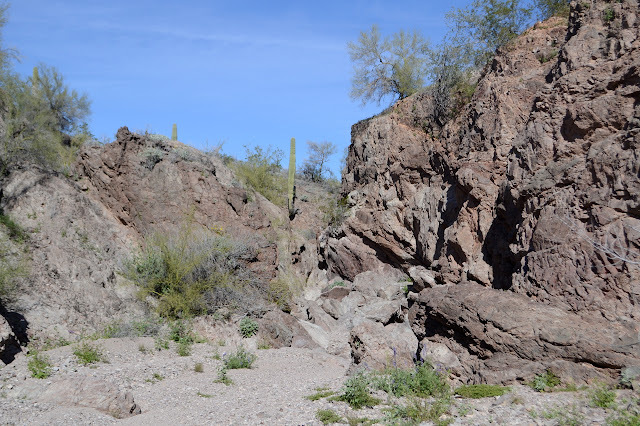 With the distinctly different look, it could have different geology, different soils, and just not support so many of the things. Or it's just the fact that it's about three miles away and rather hard to tell at that distance. The route the surveyors took to place a benchmark at the top swings way back around Fourth of July Butte and then climbs up from a mining area on the northeast side of the mountain. I am sure that road and my car wouldn't mix well, so will walk the animal superhighways to the base and then up a spot that looks inviting on the map. 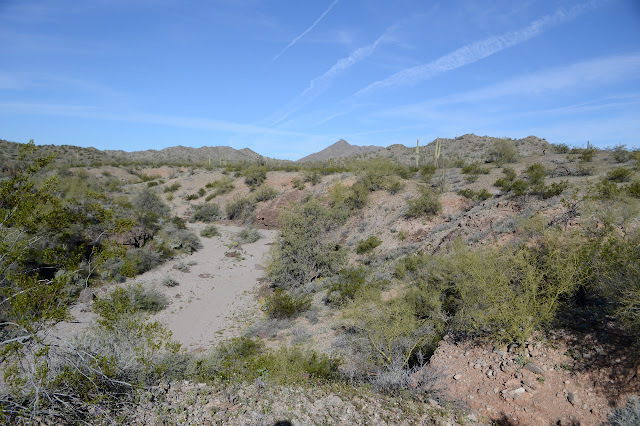 I'll use the Yellow Medicine Wash for my approach and Loudermilk Wash on the way back for some different sights and see what the "Seep Tank" on the map is. The shorter route of these between mountain and road is Loudermilk. 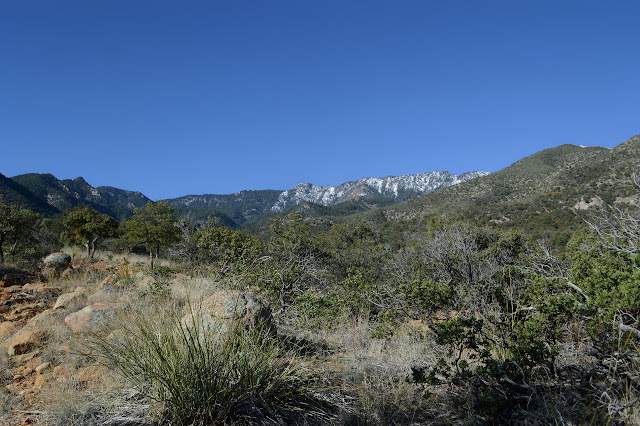 Yellow Medicine Wash and the horn of Cortez Peak beyond. The sides offer some challenge to getting into it. The first challenge is to get down into Yellow Medicine Wash. I could certainly try to walk along the side, but that will just mean having to cross all the smaller washes that empty into it. The sides may be tall, but there are spots that aren't so steep. I pick one and get over to it to follow it down. There seem to be old tire marks along the spot, but the wash has been left alone by vehicles for a long time and much of the sand feels solid under my feet. Travel is much faster along it, even where the sand is soft. There are animal footprints, coyote and deer, everywhere in the softer sand. It really is a superhighway for them. There are a few little bumps along the way. Once in a while it does throw up an obstacle. All those animals traveling it means they are all easy to pass. The passage of hooves has chipped steps into rocks or there is an obvious trail around the side. One band of rocks seems to be holding in a bit of moisture and there are very small pools and wet dirt. The whole thing is kept clear by occasional violent storms that wash out anything trying to grow in the middle. Sometimes there are quite substantial, if a little short, walls. Yellow Mesa Butte isn't much, but it catches the eye a bit in the afternoon and evening light. 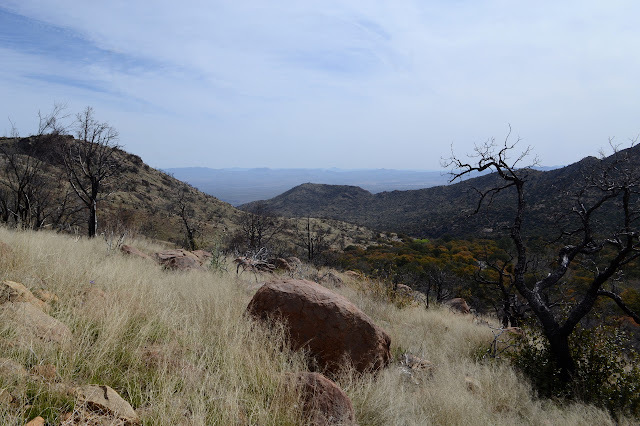 I decided to go up it, it's little pointed peak to the east, and then off to Saddle benchmark further to the east. 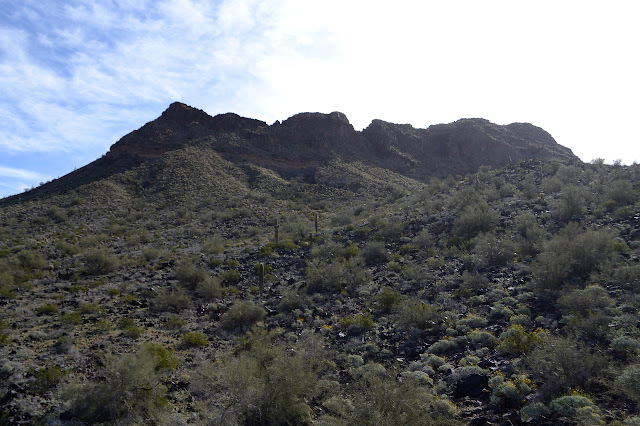 There is a bit of cliff on the north end and around the sides, all of it guarded by cholla, but I figure I can wander up a big wash along the west side to the south and take what looks like a bit of a ramp on up to the top. That's the general plan anyway. Oh, and I got some higher resolution mapping for the area. Yellow Medicine Butte in the morning light isn't quite so nice. There are a couple washes along the way to starting around the mountain and there will be a couple on it. They tend not to be quite so deep on the mountain, but the ones cutting through the desert here often have nice walls on them. 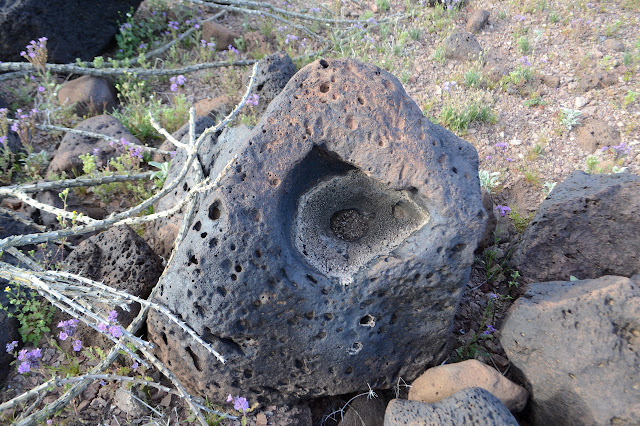 When they also have hard rock bottoms, they can hold small pools of water and one small one has just that. Little things are swimming in it. It must hold for a little while. It is just a brief diversion before getting moving up the mountain. One wash crossed. The overlooked area to the west of the butte has many mines. 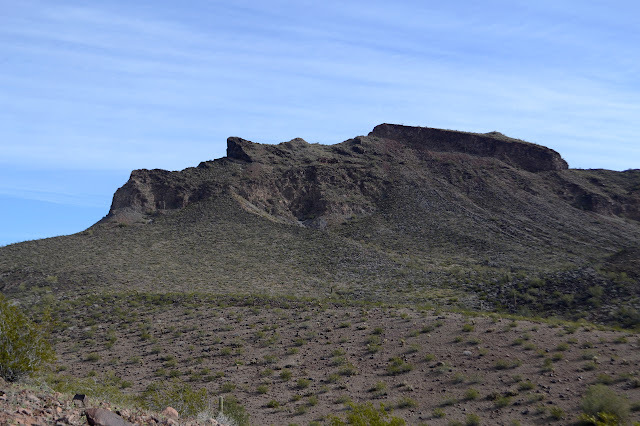 Again it is a hill whose existence was driving by volcanic forces and there are plenty of forms of basalt to look over. There seem to be constant oddities. A hole that doesn't hold water long shows interesting crystals forming after repeated leeching and drying cycles. The wash I want to follow is just ahead. I seem to be following along its right side mostly, and there is some good going there. There is nothing special about Face Mountain. It is just another bump popping out of the landscape. It does, just barely, reach the status of 1000 feet of prominence, but all the bumps in the area seem to hover around that except for Woolsey off in the east which doubles it. But it does have a cool feature. Sticking out of the side of it is the Montezuma Head. 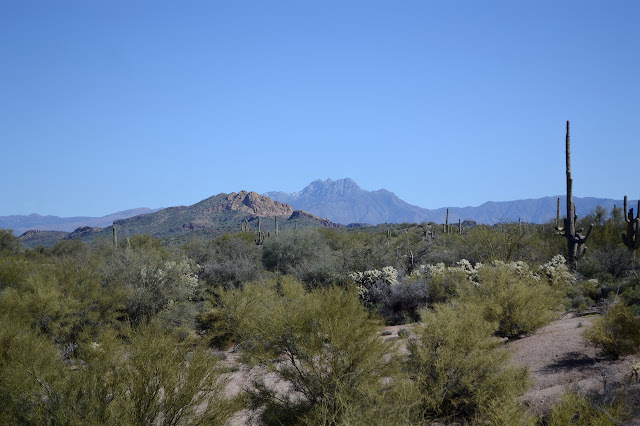 Face Mountain, a little difficult to see off into the sun, has a north peak and a south peak and the Montezuma Head. Lots of little hills popping out of the plains. 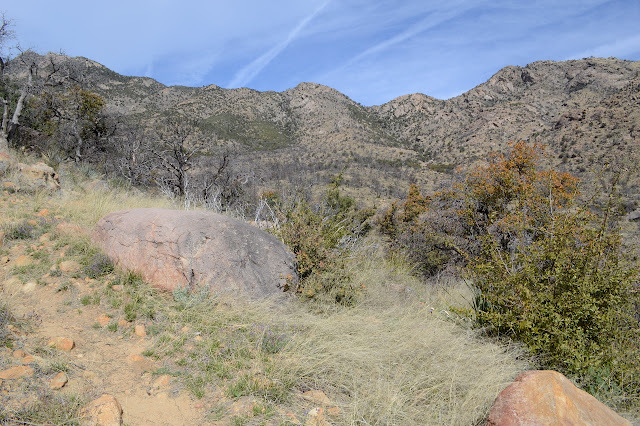 I found an area with a pair of roads into it that was impacted by camping right around the where I thought would be a good take off to go out and climb Face Mountain, so that makes easy parking. I did have to check the roads before driving one. One of them is less than ideal for a low vehicle. It continues past the camping area toward the mountain, so my start is along it. It doesn't get far before joining up with a wash and turning north. Suspecting that is not my route, I take off cross country. I wasn't able to download maps to the level I like and seem to have a lot of voice only signal with 10 second spurts of data for my shiny new pocket computer that has, I suppose, been used a few times as a phone. I have been using a quick and dirty free app called simply "OfflineMaps" that caches everything it downloads, then pointing it at 7.5' and 30' level maps. For now, I only have the course 30' level. I feel like some hard won senses of map reading and following faint trails are quickly ebbing away as I can now just glance and have myself pinpointed on a map. Maybe this low resolution exercise will be good for me. Anyway, there are some little bumps to get over between me and the mountain, so I get to gently climbing. 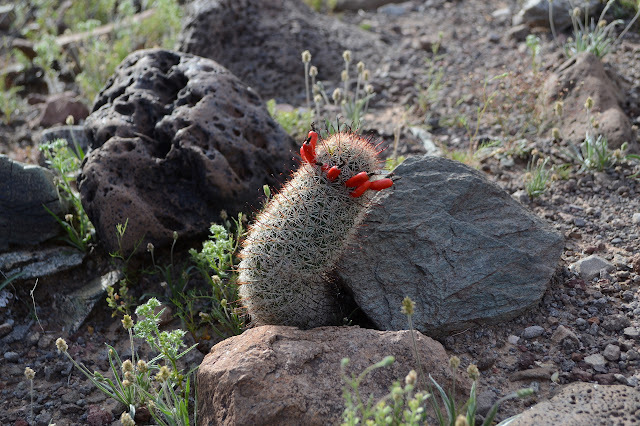 I have been seeing these little cactuses with a ring of red buds and wondering when they will bloom, but now I think they look a bit more like fruit. The Montezuma Head from the south side. On approach, the nose was putting me in mind of Bob Hope, but it is less of a ski slope from this angle.